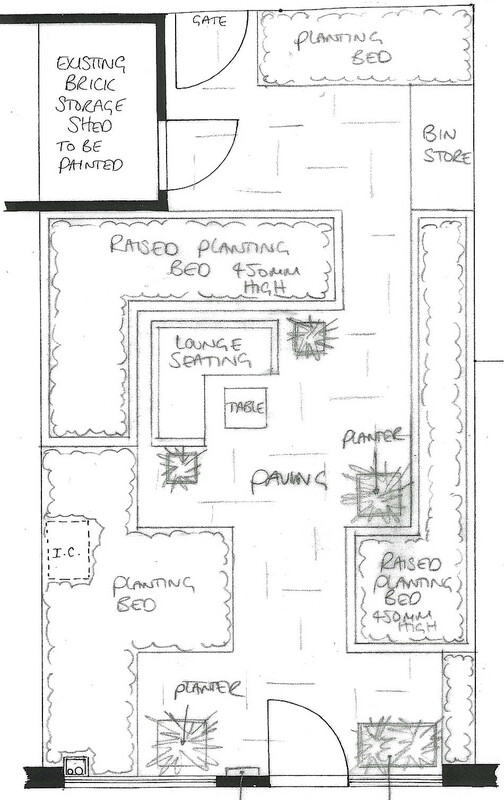 I presented the concept design to a client in Walton-on-Thames last week and I am now working on the final drawings so that we can go out to tender for the build phase of the project. My client has recently retired so she’ll now have more time to spend in the garden. She wanted to create a space that felt her own, somewhere to relax and read a book but also a haven for wildlife. 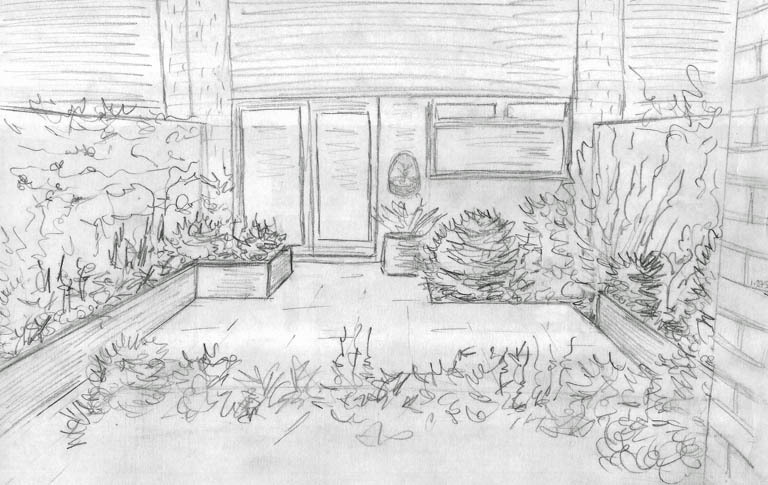 Her personal style is quite contemporary and she would like a garden that looks neat and tidy and quite slick, whilst being reasonably easy to maintain. She’d love to incorporate a couple of sculptures too. 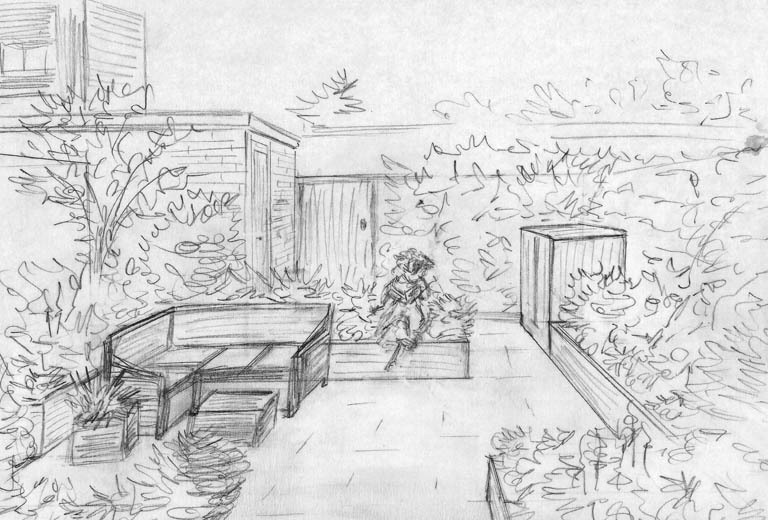 The garden is really small so it made sense to create a courtyard style garden. My client really wanted some raised beds to create some additional interest. Even beds just 30cm high will provide a different feel to the garden. The existing shed at the end of the garden is in need of repair, but it’s nothing that a lick of paint and a new door and roof won’t sort. You’ll notice too that I have included a bin store – this may seem strange, but it’s the only place that she can keep her wheelie bins so it’s important that they’re tucked away out of sight. Rather than a table and chairs for eating, we have gone for lounge seating which will enable her to sit outside and read more easily – we wanted to create a space for relaxation so this made more sense. If budget allows, we hope to use a contemporary sawn paving which will give a much cleaner finish. In such a small space, the material costs shouldn’t impact the budget too much so I am confident that we will be able to achieve this. I hope you like the concept idea – I’ll be sure to blog the final designs and the progress when the build starts.